: You only pay shipping cost to return the product back to us. If you return the product within 30 days of original shipment prepaying shipping costs back to us, we will be happy to refund original price of the product as well as original shipping charges. These are so unique and adorable keepsakes and gifts. 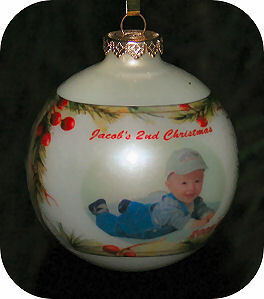 We can put any picture, in color or in black and white on a Glass Christmas Bulb for you. You will not find this ornament anywhere on the internet or in any stores. This product is our newest and best addition, result of over one year of research, development, testing and tinkering. any memorable moments from this or past years can be captured and preserved on our glass ball ornaments for years and even generations to come. We customize a white pearl Christmas glass ornament by printing your image and words into one of our pre-designed borders onto a clear band and band the image permanently to the ornament. Some of our customers make a true FAMILY TREE for Christmas, purchasing ornaments with pictures of each family member, Grandmas and Gradpas, Parents, Kids, Aunts and Uncles - then setting these ornaments on a Mini-Christmas Tree as a table decoration to let everyone in the home remember all family members and admire their NEW FAMILY CHRISTMAS TREE. IMPORTANT: to order this item, you will need to email us the picture to be applied to your ornament. Our server will email you confirmation of your order with Order Number in the subject. If you are ordering more than one ornament and emailing several pictures, be sure to describe in your email: picture named - samantha.jpg goes with Samantha name, picture named MVC1765.JPG goes with Smith Family ornament. If you are having trouble emailing the picture, you can also UPLOAD it to our website from this link - AFTER you place your order because you will need to have ORDER NUMBER Assigned before you can upload your picture. You can view additional border designs (( new designs added frequently!!! )) Click here to view other border designs for our photo ornaments. If you are ready to order our photo ornaments, scroll down on this page where you can personalize the ornament and click ORDER button to add it to your cart. All ornaments are packaged in individual clear display box.